“The Portuguese dared to defy the great sea ocean”, wrote Pedro Nunes, “they discovered new islands, new lands, new seas, new peoples: and what else is there: a new sky, new stars”. 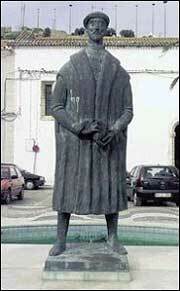 The greatest mathematician of the period of Discoveries was born 500 years ago in the city of Alcácer do Sal. Almost nothing is known of his origin, very little is known of his life and much remains unknown of the relationship with the scientists of his day. However, it is possible to reconstruct his work through his publications and the many references made to him by the great intellectuals of that time. He was called Pedro Nunes and this was how he signed his name, yet his name appears many times in the Latinised form of Petrus Nonius. All that is known is the year of his birth  the month and day are both unknown. The exact date of his death, however, is known, 11 August 1578. 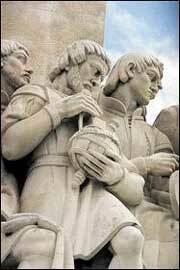 His life, just as that of Camões (c. 1524-1580), coincided with the period of utmost greatness of our country. Shortly after the death of these prominent Portuguese men, Filipe II of Spain ascended to the throne of Portugal and the country lost its independence, which it only recovered in 1640. By that time, the period in which Portugal and Spain indisputably dominated the seas had come to a close. In the Iberian Peninsula, Science and Mathematics had also lost most of their greatness. As it seems, Pedro Nunes had Jewish origins for Damião de Góis described him as “Portuguese of nation”, a reference normally applied to converted Jews. Nevertheless, nothing in the writings of Pedro Nunes reveals any sign of Crypto-Judaism and the few religious references found in them area clearly Christian. There are also no signs of Nunes ever having been persecuted  throughout his life he was protected by kings and princes. His grandchildren, however, spent a few years behind bars, accused by the Inquisition of professing Judaism. In similarity with the Italian mathematician Francisco Maurolico (1494-1575), Pedro Nunes worked during the period that fell between Regiomontano (1436-1476) and Viète (1544-1603). Just as the astronomer Tycho Brahe (1546-1601) and the cosmographer Christopher Clavius (1538-1612), he lived in the intermediate period between Copernicus (1473-1543) and Galileo (1564-1642). Sandwiched between these two eminent figures that marked turning points in the fields of Science and Mathematics, the work of Pedro Nunes has been less studied than it deserves. At the time, however, his contributions were fully recognised, and continued to be so until the end of his life. 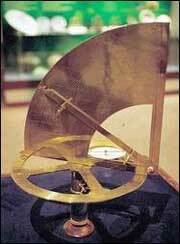 Replica of the Kynuyn Quadrant (Museu de Marinha, in Lisbon) manufactured in 1595 in London. It is the only instrument to have survived the period enriched by the nonius, discovered by Estácio dos Reis. The nonius appears here on the 45 concentric circular scales marked on the face of the quadrant. Practically on his deathbed, Nunes was entreated by the envoys of Pope Gregório to give his opinion on the reform of the calendar. He was, however, unable to respond to this request. Brahe, the greatest astronomer of the pre-telescopic era, tried out one of his inventions, which he called “subtle process”. And Clavius, the greatest figure of the Colégio Romano, the great centre of catholic knowledge of that period, classified him as “supreme mathematical genius”. Pedro Nunes studied in Lisbon and Salamanca, where he met Guiomar de Aires, a Castilian Christian whom he married and of whom he had six children. After receiving his bachelor degree, he was hired as lector by the University of Lisbon, where he later obtained a PhD in Medicine. With this academic title, acquired in the only scientific area of the time that granted it, Nunes was able to continue with his mathematical research in a more comfortable position. While still in his early twenties, his genius was noted in the court. By decision of King D. João III, he became tutor of princes D. Luís and D. Henrique, teaching them Logic, Philosophy, Geometry and Mathematics. At the age of 27, he was nominated royal cosmographer, a position of great prestige in the country. Two decades later, he was nominated principal cosmographer to the king. In order to comply with his obligations as cosmographer and tutor of the princes, Pedro Nunes renounced his academic position. He was once again nominated professor after the university was transferred to Coimbra in 1537, where he lived for the rest of his life. 1562 was the year of his jubilee and he died sixteen years later, in 1578, in Coimbra. He was called to Lisbon frequently to advise and examine pilots, to assist in the cartography of lands and seas discovered up until that period and to deal with scientific matters of interest to the reign. Shadows Instrument of Pedro Nunes manufactured by Humphrey Cole (1572-1624) in London, on display at the Science Museum of this city. ”De erratis Orontii Finaei”, the most polemical work ever written by him. It was a refutation of the mathematician of the Colégio Real de Paris, Oronce Fine (1494-1555), who claimed to have resolved the three classical geometrical problems of Greek geometry: the trisection of any angle, the duplication of the cube and the quadrature of the circle, using only an ungraduated ruler and a compass. Pedro Nunes did not prove the impossibility of resolving these problems, as the mathematical instruments of that time did not make such a demonstration possible. This demonstration was only achieved in the nineteenth century. However, the refutation of the “proof” presented by the French mathematician was of impeccable precision. It is significant that the recently-arrived professor of Coimbra was the first in Europe to have confronted the French professor, thus showing his superiority in the command of Geometry. Pedro Nunes’ most important works, however, are prior to “De erratis” and to his nomination by the University of Coimbra. The first printed work of the mathematician, the “Tratado da Esfera”, was published in 1537, in Lisbon. It is composed of several works, as was customary at the time, and includes translations of classical works, enriched with comments and additions that denote a profound knowledge of the difficult cosmography of the period. It also incorporates two small original works in which Nunes puts forward his theory of the loxodromic curve, with which he discusses navigation via the shortest route and using a constant cardinal direction. The loxodromic curve is perhaps the most important discovery of Pedro Nunes and the one he regarded most highly. As occurs with many mathematicians, it is also perhaps his first major discovery, at least if we use the date of publication as a guide. This discovery was again discussed in 1566, in the collection of his works published in Basle. Had it been merely the discovery of a mathematical curve, the topic could have been interesting and could have had repercussions on the development of this subject, as it did; however it was much more than that. It was the geometrical resolution of a problem crucial to navigation, changing the manner in which oceans were mapped and the world was represented. Pedro Nunes’ ensuing publication was “De Crepusculis”, normally considered his most important work. In this work, published in 1542 in Lisbon, he resolves a very difficult problem of spherical geometry  the precise determination of the duration of twilight for a given latitude and given day of the year. The creation which made Pedro Nunes most famous was the nonius, also put forward in “De Crepusculis”. This system brings together several scales, making it possible to obtain more precise measurements than any of the individual scales. With this system, Nunes puts forward a solution to an urgent problem of that time  the problem of accurately measuring the angles of altitude of celestial bodies. 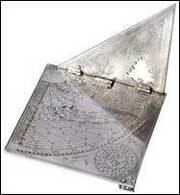 The nonius arose with a system of 45 scales on an astrolabe, but was later applied to other measuring instruments. Today it is common in the measuring sticks used to measure lengths. The nonius underwent several improvements, the most practical solution being proposed by the Frenchman, Pierre Vernier (1584-1638) in 1631, which reduced the nonius to scales, one of them fixed and the other movable. Vernier himself used to say that his invention was a perfected nonius and for a long time it was known as the “nonius”, even in France. In the eighteenth century, the French starting calling it the “vernier, a designation that became generalised almost worldwide. If we look at the two systems today, it is difficult to understand that they are two forms of applying the same principle; however, if its evolution is studied, the continuation of the idea of the Portuguese mathematician becomes apparent. Pedro Nunes produced other remarkable works of Geometry and Algebra and also put forward innovative proposals for the resolution of various navigation problems of his time. Some of his ideas did not have great applicability while others were in fact useful, although they were not always immediately understood. It is known, for example, that his meetings with the men of the sea were not always the most productive. He himself wrote, “I know just how badly pilots suffer, speak of India those who have never been there, and navigate in the sea those who have never been to sea”. However, Pedro Nunes was a mathematician and a cosmographer. His astronomical navigation works interested him, above all, for the theoretical problems he saw in them and which served as his inspiration. He knew that the Portuguese had discovered “new islands, new lands, new seas, new peoples”, yet Pedro Nunes looked up and there was something else that interested him. And he continued: “And what else is there: a new sky, new stars”.